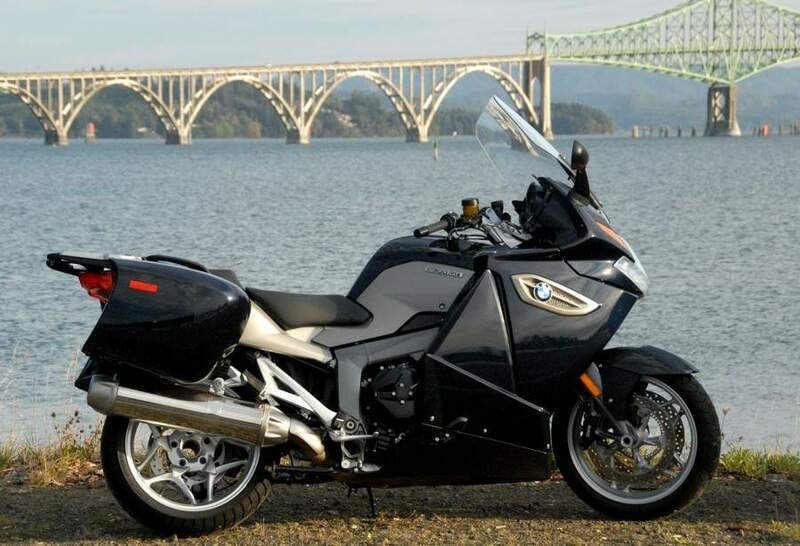 If you’re not of the Harley set, nor ready to join the local Wingnut chapter, but still want to cover distances two-up with contorted sections of pavement between point A and B, then the 2009/10 BMW K1300GT might be your upscale ticket. This titan of sport-touring was graced with virtually all of the newness given this year to its sporty brother, the K1300S; therefore the GT packs a similar wallop from the big 1,293cc mill. Yet with the GT you can stuff two roomy standard equipment hardbags full of whatever it is you might fill them with while chasing the wind, or running from responsibility for a long weekend. 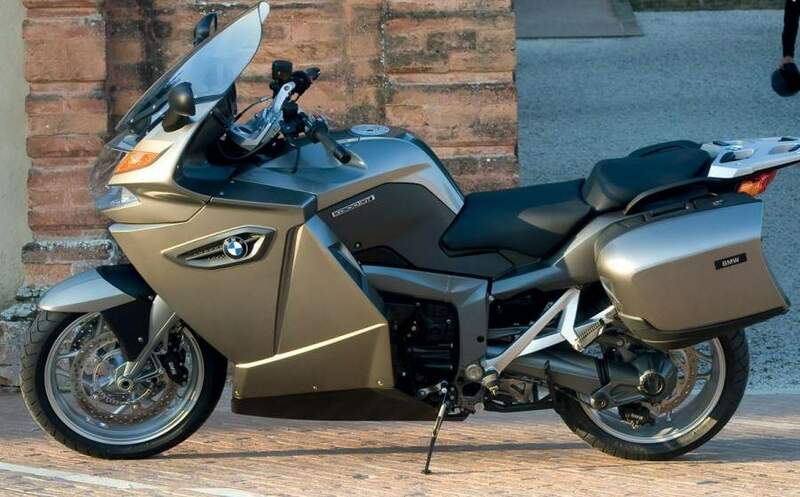 The German speed tourer picked up a BMW badge and faux venting in the main side cowling to break-up the appearance of the unimaginative acre of bodywork on the previous K bike model. Instruments and instrument trim are freshened up also. The GT boasts 160 hp at 9,000 rpm with 99 ft-lbs at 8,000 rpm. In addition, BMW claims that 80% of max torque is available as early as 3,500 rpm. The K1200GT produced a claimed 152 horsepower at 9,500 rpm and 96 ft-lbs at 7,750 rpm. According to BMW, though the new GT’s engine is nearly identical to the 2009 S model, its more restrictive exhaust and smaller ram-air/airbox capacity account for the lion’s share of a 15 hp deficit to the new S model’s claimed 175 ponies. With this considerable boost in peak horsepower, the ’09 GT might be back in contention with the rest of the sport-tourers for top-honors in the 1,300cc (give or take) class. Figuring a worst-case scenario 15% loss of ponies to the back wheel, the Beemer might produce somewhere around 135 hp. This puts it on target with the much larger displaced Kawi Concours 14 that’s seen published dyno results of around 134 hp. Even if it won’t surpass the C14 in sheer power, the BMW will likely out-pull the FJR1300's 124-ish rwhp. And as much as we like the Honda ST1300, unless Big Red secretly cast some good juju over the ’09 model, it won’t even come close. But you’re not riding the K1300GT for ultimate speed anyway, you’re riding the GT to go “fast enough,” and do it with some style, convenience and comfort. Let Ricky Racer pass you if he wants; you’ll get to where you’re going with less windblast fatigue and covered in far fewer bug guts than he, thanks to your electronically adjustable windscreen – in tall flavor as standard. Electronically adjustable windscreen now comes in tall version. Handlebar height is adjustable vertically over a 1.5-inch range and either the standard or no-cost optional seat are adjustable. Lots of personalized fit is available on the big mill GT. The sport-touring K bike initiates turns well thanks to leverage offered by high and wide bars. The combination of an excellent chassis and electronically adjustable suspension (ESA II) round out the handling package quite nicely. Additionally, you’ll have the ability to adjust handlebar height vertically over a 1.5-inch range, or tweak the adjustable standard rider seat from 33.1 to 32.3 inches. An optional adjustable (32.3” to 31.5”) lower saddle is available at no cost. Most riders will appreciate the seat at 32.3 inches for its reasonable roominess between seat and peg, however, those with less than a 30-inch inseam might find they can plant only one foot securely at a stop. Partial-integral ABS is standard on the GT, but unlike on the S model ABS cannot be disabled. BMW says the ability to disable the anti-lock system on the sport-oriented S is primarily for race track settings. The Beemer’s brake system works very well, but some pulsing can be felt through the rear brake pedal whether applying only the rear, or the front brake which also activates the rear. This minor and occasional pulse is a non-issue when compared to past experiences with the FJR1300’s ABS and its propensity to nearly punt a rider’s fingers off the lever when ABS activates. Looking beyond the K1300GT’s high-feeling CoG, the tall and wide bars provide leverage needed to tip in to corners with relative ease. Once set in a turn, the same excellent chassis as found on the hot-rod K1300S keeps the GT feeling like it’s on a magnetic rail through bends. Also, carrying 75 lbs more than the 560 lbs Wet Weight of the K1300S seemed to provide the GT with a more forgiving front end than what I experienced on the heavily sprung S model. Of the four key motorcycles in this U.S. market segment, Yamaha’s FJR1300 is likely the best match-up to the BMW in terms of overall performance. The FJR’s steering geometry implies a quicker handling bike with a 1.1-inch shorter wheelbase (60.8” v. 61.9”), steeper rake of 26 degrees as opposed to the GT’s 29.4 degrees, and a slightly shorter trail figure of 4.3 versus 4.4 inches. However, the Yamaha gives up 6 lbs in claimed wet weight to the GT’s lighter, ready-to-ride weight of 635 lbs. Is 6 lbs noteworthy? To some this difference is significant, to others not so much. Nevertheless, an excellent sparring session between these two wicked-fast weekend-warriors seems inevitable. The venerable ST1300 has slightly edgier geometry than the Yamaha with tighter wheelbase and trail figures. But a claimed real-world weight of 719 lbs pegs the Honda as the fatty of the group, while Kawasaki’s C14 is a not-too-distant third for overall heftiest at 670 lbs (679-ABS model). Choosing ABS-equipped versions of the ST1300 and Concours 14 for the sake of parity: the 2009 K1300GT’s base model MSRP of $18,800 is $3,100 more than the second-most expensive Honda, $4,310 more than the FJR, and a whopping $4,500 costlier than the bargain (and displacement!) champ Kawasaki. And, as usual, BMW Motorrad always presents fans of its products the opportunity to go whole-hog with available options. This time ‘round the Premium Package is the only trim level available and raises the bike’s cost to $22,245, sans freight charges. The package includes every piece of available equipment from the a la carte menu except the Anti-Theft Alarm ($395).